On September 29, 2018, the federal stage of the Torch Relay of the 29th World Winter Universiade 2019 started in Russia to cover 30 major cities of the country. Moscow was the first city in our country to welcome the fire of the Universiade-2019. The Torch Relay started in Zaryadye Park. Russian Sports Minister Pavel Kolobkov, Senior Vice President and Financial Director of Norilsk Nickel Sergey Malyshev, Head of Moscow Sports Department Nikolai Gulyaev, ambassadors of student games Alexei Yagudin, Olympic champion in figure skating, and the winner of “Golos“ show season five Daria Antonyuk welcomed the participants of the project and the audience. The total length of the route of the Torch Relay in the capital is 7,500 m. The journey of the fire passed by famous sights: the Soaring Bridge, St. Basil’s Cathedral, the Pashkov House, the Kremlin, the monument to Peter I, the Crimean Bridge, the Pushkin Bridge, and others. 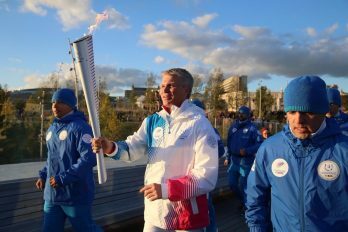 57 torchbearers carried fire along the streets of Moscow, among them Mikhail Kotyukov, Minister of Science and Higher Education, Alexey Nemov, four-time Olympic champion in artistic gymnastics, Andrei Vatutin, President of the CSKA basketball club, and others. The Moscow stage finished at the Festival walkway of the Olympic complex Luzhniki. The fire was brought to the main stage by the Olympic champion in speed skating, the Head of the Moscow Sports Department, Nikolay Gulyaev. 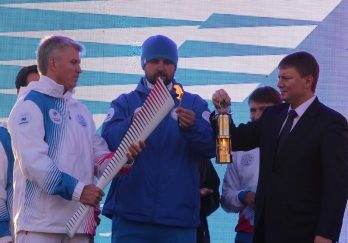 Acting Minister of Sports in the Krasnoyarsk Territory Sergey Alekseev, the Head of the Directorate of Universiade 2019 Maxim Urazov, the President of the Russian Student Sports Union Sergei Seyranov took part in the ceremony of lighting the city cup of fire. Popular Russian artists Antoha MS, Folk Beat, Kravts, and Mot performed their hits for Moscow residents during the celebration program of the torch relay. After performances of the celebrities, other vocalists, actors, dancers, and circus performed their creative acts. The concert program was closed by the performance of the singer Elena Temnikova. The Torch Relay of the Winter Universiade 2019 started in Turin on September 20, 2018, on the International University Sports Day. During 164 day, the torchbearers will carry the fire of the Universiade through the streets and squares of 30 cities of Russia. These are large economic, sports and cultural centres, in a number of which the leading universities of the country are situated: Moscow, Arkhangelsk, St. Petersburg, Kaliningrad, Simferopol, Rostov-on-Don, Stavropol, Grozny, Kazan, Yekaterinburg, Vladivostok, Irkutsk, Barnaul, Novosibirsk, Tomsk, Abakan, and Kyzyl. Cities of the Krasnoyarsk Krai, such as Norilsk, Kodinsk, Yeniseisk, Kansk, Zelenogorsk, Minusinsk, Nazarovo, Achinsk, Zheleznogorsk, Divnogorsk, the villages of Tura and Shushenskoye are also included in the route. Each of these cities will host three main parts of the relay: the fire welcoming ceremony, the relay itself along the streets and squares of the city, and the ceremony of lighting the city fire cup of the Winter Universiade 2019 together with a concert program. The Torch Relay will finish on March 1, 2019 in Krasnoyarsk, and the very next day the opening ceremony of the 29th World Winter Universiade 2019 will begin, on March 2, 2019, at 20 hours 19 minutes. R.I.M. 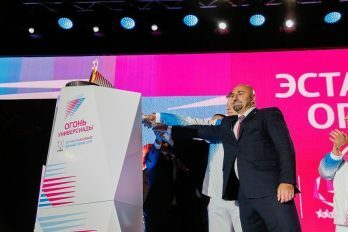 Communications Agency, being the official partner of the Universiade Directorate, provides the organizational, logistics and informational support of the relay. This is the second Torch Relay after Sochi 2014 in which the agency actively participates. Holding a Torch Relay before major competitions such as the Olympics and Universiade not only attracts fans, but also allows all residents of the country to feel as participants of a big sports festival. The first torchbearer of the Moscow stage of the relay – the Minister of Sports of Russia, Olympic fencing champion Pavel Kolobkov.